USC Salkehatchie is honored to have Mr.Raye on the Walterboro campus Feb 25 at 6:30. Come join us! Now Raye, 68, a senior adviser for the NFL who had an extended coaching career following a groundbreaking quarterback role at Michigan State, has an appreciation for what many take for granted — watching a game in which the competition is not conducted against the backdrop of segregation. Though Raye never realized his dream of becoming an NFL head coach, he helped pave the way for others. “I was probably 9 years old, and I can remember my dad taking me to see Michigan State games — they had what they called ‘Dollar Days’ where you could get an end-zone seat — and watching Jimmy Raye,” says Tony Dungy, who played quarterback at the University of Minnesota decades before becoming the first African-American coach to win a Super Bowl. Raye likely would have never had the opportunity to launch his coaching career at Michigan State if not for the so-called “Underground Railroad” that marked the legacy of the late coach Duffy Daugherty. In Daugherty’s movement, premier African-American players from the South attended schools in the North in a sports-world version of the Great Migration. In Michigan State’s case, detailed in Tom Shanahan’s recent book Raye of Light, the players included Raye, Bubba Smith, Gene Washington and George Webster. Daugherty’s pipeline was fortified by relationships he built with African-American high school coaches in the South, whom he hosted for clinics in East Lansing that were in stark contrast to clinics in their own region that they were barred from attending. The University of Minnesota was another beacon of change. 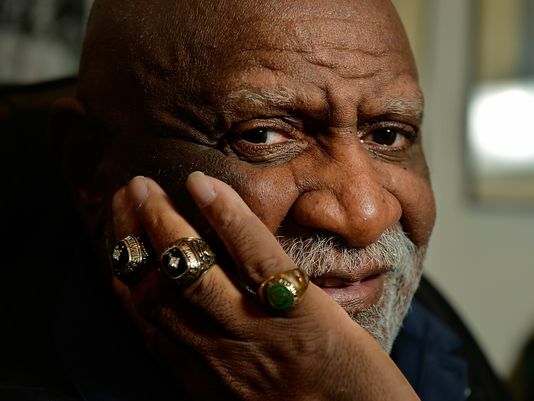 Three players who ultimately wound up in the Pro Football Hall of Fame — Carl Eller, Bobby Bell and Charlie Sanders — all migrated from North Carolina to play for the Golden Gophers. Like Daugherty, Minnesota’s coach at the time, Tennessee native Murray Warmath, had relationships with African-American coaches in the South. Eller, from Winston-Salem, went to Minnesota in the early ’60s. But he wasn’t the only Gopher from that era to make an impression on Raye. Minnesota appeared in back-to-back Rose Bowls in 1960 and 1961, quarterbacked by Sandy Stephens — the first African-American to earn All-America honors at a major college. The late Stephens didn’t grow up in the South; he was from Uniontown, Pa. But he resonated with Raye, who at the time figured that his college opportunities were limited to historically black institutions such as Florida A&M, Tennessee State, North Carolina A&T or Grambling. Raye’s world soon would change as he came of age during the height of the civil rights movement. As much as he can recall historical markers such as Martin Luther King Jr.’s “I Have a Dream Speech,” the assassination of President John F. Kennedy and the passing of the Civil Rights and Voting Rights acts, he will never forget what it was like to grow up in the South. Raye knows what it was like to proceed with caution in social interaction with whites. He knows what it was like for African Americans in the segregated South to experience their institutionalized second-class citizenship, which barred them from restaurants, relegated them to the balcony at movie theaters and expected them to move to the other side of the street when approaching whites on the sidewalk. This was always so much deeper than his ability to throw a football. Raye marvels at seeing so many black quarterbacks on the college and pro levels getting the opportunities that were so hard to come in his day. “At that time, there was a stigma that barred blacks from maintaining leadership roles — not only at quarterback, but also at positions like center and middle linebacker,” Raye says. Raye and another former Michigan State player from the 1960s, Sherman Lewis, eventually had long coaching careers in the NFL. But in another sense, Raye and Lewis were saddled by the times. When Raye landed his first job in 1977, as a receivers coach under Bill Walsh with the San Francisco 49ers, there were just three other African-American assistants in the league. This was a decade before Art Shell became the first African-American head coach in modern times, with the Oakland Raiders. It was more than two decades before the Rooney Rule requires NFL teams to interview minority candidates for coaching vacancies. Although Raye was mentioned as a head coaching candidate for the better part of a decade, he was consistently passed over — like so many other African-Americans. It’s no wonder that when Dungy reached the mountaintop and won Super Bowl XLI with the Indianapolis Colts — when he and opposing Chicago Bears coach Lovie Smith both became the first African-American head coaches to reach the Super Bowl — he began his postgame press conference by paying homage to Raye and a handful of others who were denied the opportunity he enjoyed. Dungy’s gesture in 2007 was so fitting for that moment in history. Jimmy Raye knows. Equal opportunity is the first step.